Incoming President Rodrigo Duterte (L) listens as outgoing President Benigno Aquino talks to him before Aquino leaves the Malacanang Palace in Manila, Philippines, June 30, 2016. A harsh-spoken man known for ruthlessly enforcing laws at the city level took office as president of the Philippines Thursday with pledges to get just as tough on crime nationally. But there are hopes he will pursue a broader agenda as head of state. Rodrigo Duterte, former mayor of the second largest Philippine city, Davao, was inaugurated after beating four other candidates in last months election with 39 percent of the vote. The 71-year-old outsider to national politics was elected largely because of his record for cutting crime in Davao. His city was once a drug sales hub and a base for a violent leftist rebel group. Duterte pledged in his inauguration speech in Manila to rout corruption and drugs. Using his characteristically sharp language, he also took on the widespread suspicion that he had deployed death squads to enforce order in Davao. As mayor of Davao for 22 years, the man known for profanity and threats when outraged about an issue, brought down crime by being unpredictable, said city spokesman Leo Villareal. 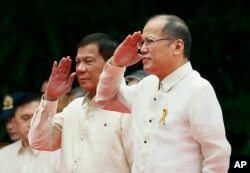 New Philippine President Rodrigo Duterte, left, and outgoing President Benigno Aquino III salute during inauguration ceremony Thursday, June 30, 2016. Drug sales have fallen 75 percent from their peak and the leftist New People’s Army stays hidden in the mountains, he added. Some inhabitants of Davao City, as well as other Philippine political leaders believe Duterte --nicknamed “the punisher” -- used extrajudicial killings to stop crime, though a probe in 2009 never brought the allegations to court. Many in his hometown of 1.6 million people say they forgive him for any death squad activity, as whatever means he used made the city safer. Now they hope he can broaden his portfolio as president to keep peace with China and stimulate an economy in a country where about a quarter of the population lives in poverty. On Thursday the president demanded transparency in government and equality for people on both sides of the wealth gap. He did not spell out an agenda for foreign policy or for the economy, which depends largely on agriculture, call centers and remittances from overseas. People in his hometown told VOA Duterte also should get less angry to avoid offending people, make peace with three violent Muslim rebel groups, and pursue an economic agenda that spreads resources around the country, not just the provinces near Manila. Mindanao, the southern island that includes Davao City, has some of the country’s highest poverty rates and lags behind other islands in infrastructure and industry, locals say. Three violent Muslim rebel groups still operate on Mindanao despite a peace deal with the largest group of rebels. In April, a group beheaded a Canadian tourist, one of about 120,000 people who have died in Mindanao conflicts since the 1960s. Duterte met with two of the rebel groups in mid-June to propose a federal system of government that would give Muslims more autonomy. Others said new president should also ensure peace between the Philippines and China. The two countries have been at odds since 2012 over contested maritime claims as Beijing expands militarily across the South China Sea. Outgoing Philippine President Benigno Aquino in 2014 took the matter to a U.N. arbitration court over China’s protests but did not talk with Chinese leaders directly. The court is to issue its ruling July 12. Aquino left office Thursday after reaching his six-year term limit.